Word Among Us Press (Frederick, Maryland). If it has been a long time since you read a book about the Mass, “Behold the Mystery” is a good one to read. Author Mark Hart is a young adult, husband and father of four who is also executive vice president of Life Teen International, a “Catholic youth ministry leading teens closer to Christ.” His book is a fine one for older teens, to be sure, but it will make ideal reading for anyone who wants to refresh his or her understanding of and appreciation for the Mass. You’re the rare Catholic if you have never grown at least a little weary of Mass, or if you have never nodded off during a homily that didn’t capture your attention. Hart suggests that the problem isn’t with the Mass, the problem is with your understanding of the Mass. Also, he asks, when was the last time you prayed for the priest or priests who preside at your parish’s Masses? Are we laity doing our part to make the Mass all that it can be for everyone concerned? The heart of “Behold the Mystery” may be the section in which the author discusses the meaning of each part of the Mass. Perhaps the one weak point of the book is Hart’s decision to simply repeat the traditional language about the bread and wine becoming “the very body and blood of our lord and savior, Jesus Christ.” This section might have been improved had the author addressed the fact that, according to various surveys, a significant percentage of Catholics don’t accept this as literally true. It can be hugely helpful to explain that “body and blood” is a Semitic phrase for “the whole person.” It can also be helpful to add that it is the “whole person”/”body and blood” of the risen Christ that we receive in holy Communion. To accentuate this can magnify one’s sense of the overwhelming mystery of the Eucharist. Catholics frequently find these insights helpful to renewing their understanding of and faith in the Real Presence. Here, however, is the bottom line: “Behold the Mystery” is a lively and informative book, one that this reviewer would not hesitate to recommend to all. “Mass 101” is a first-rate book on the Mass, one written in language that is both theological and accessible to most adult readers. The author, Emily Strand, is a former campus minister and teacher at the University of Dayton who is now a full-time mother and member of the Worship Commission for the Archdiocese of Cincinnati. In her Introduction, Strand declares: “Perhaps the most valuable notion about the Mass to take away from this volume is an idea of its profundity — its endless wealth of significance that no one book has or will ever capture.” To that end, following the first chapter titled “Why Learn About the Mass?” Strand offers gripping discussions of the history of the Mass and what Vatican II taught about the Mass. In a section titled “The Paschal Mystery and the Ministers of the Mass,” Strand makes it clear that while the priest “has the principal role” in the Mass, he isn’t the only “minister.” She explains the roles of others including the ministers of music, lectors, extraordinary ministers of holy Communion, servers, ushers and others. Thus, Strand illustrates the important fact that not only the priest, but the entire assembly, celebrates the Mass. The remaining four chapters examine the parts of the Mass, “unpacking” the meaning and purpose of each. More than a few readers may be particularly interested in the appendix, “The Third Edition of the Roman Missal and the New Translation of the Mass.” Here Strand explains extraordinarily well the new translation of the Mass prayers that English-speaking Catholics began using a couple of years ago. 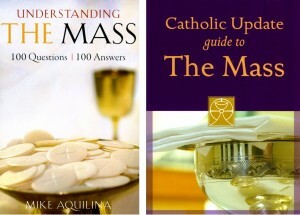 “Mass 101” is clearly written, informative, and complete. It’s the best book on the Mass for Catholic readers this reviewer has come across in quite a while. Finley is the author of more than 30 books for Catholics including two used widely in parishes, “The Joy of Being a Eucharistic Minister” and “The Joy of Being a Lector” (Resurrection Press).